This volume features a nice article by John Hauser, an MIT Marketing prof and a new contributor to JDM, on how recognition-based heuristics relate to the marketing literature. We at DSN think this is a very promising area for future research. Recognition-based judgments and decisions: What we have learned (so far), pp. 359-380. Effects of ignorance and information on judgments and decisions, pp. 381-391. The beauty of simple models: Themes in recognition heuristic research, pp. 392-395. A marketing science perspective on recognition-based heuristics (and the fast-and-frugal paradigm), pp. 396-408. Recognising the recognition heuristic for what it is (and what it’s not), pp. 409-412. The limited value of precise tests of the recognition heuristic, pp. 413-422. On the use of recognition in inferential decision making: An overview of the debate, pp. 423-438. Photo adapted from S. M. Daselaar, M. S. Fleck, and R. Cabeza. 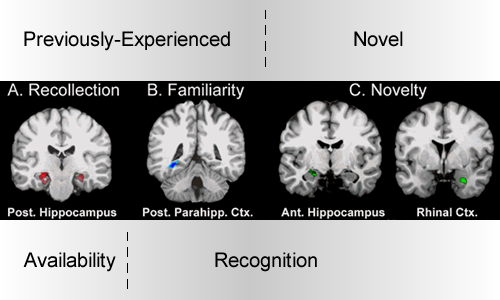 (2006) Triple Dissociation in the Medial Temporal Lobes: Recollection, Familiarity, and Novelty. Journal of Neurophysiology 96, 1902-1911. Third of three special JDM journal issues on the Recognition Heuristic was written on August 9, 2011 and filed in Articles,Ideas,Research News.